Hydrophobic interactions in proteins Structure describe the relations between water and hydrophobes (low water-soluble molecules). Hydrophobes are nonpolar molecules and usually have a long chain of carbons that do not interact with water molecules. The mixing of fat and water is a good example of this particular interaction. The common misconception is that water and fat don’t mix because the Van der Waals forces that are acting upon both water and fat molecules are too weak. However, this is not the case. The behavior of a fat droplet in water has more to do with the enthalpy and entropy of the reaction than its intermolecular forces. Hydrogen bonding, Interaction involving a hydrogen atom located between a pair of other atoms having a high affinity for electrons; such a bond is weaker than an ionic bond or covalent bond but stronger than van der Waals forces. Hydrogen bonds can exist between atoms in different molecules or in parts of the same molecule. One atom of the pair (the donor), generally fluorine, nitrogen, or oxygen atom, is covalently bonded to a hydrogen atom (−FH, −NH, or −OH), whose electrons it shares unequally; its high electron affinity causes the hydrogen to take on a slight positive charge. The other atom of the pair, also typically F, N, or O, has an unshared electron pair, which gives it a slight negative charge. Mainly through electrostatic attraction, the donor atom effectively shares its hydrogen with the acceptor atom, forming a bond. Because of its extensive hydrogen bonding, water (H2O) is liquid over a far greater range of temperatures that would be expected for a molecule of its size. Water is also a good solvent for ionic compounds and many others because it readily forms hydrogen bonds with the solute. Hydrogen bonding between amino acids in a linear protein molecule determines the way it folds up into its functional configuration. 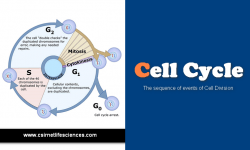 Hydrogen bonds between nitrogenous bases in nucleotides on the two strands of DNA (guanine pairs with cytosine, adenine with thymine) give rise to the double-helix structure that is crucial to the transmission of genetic information. American chemist Walter Kauzmann discovered that non-polar substances like fat molecules tend to clump up together rather than distributing itself in a water medium because this allows the fat molecules to have minimal contact with water. 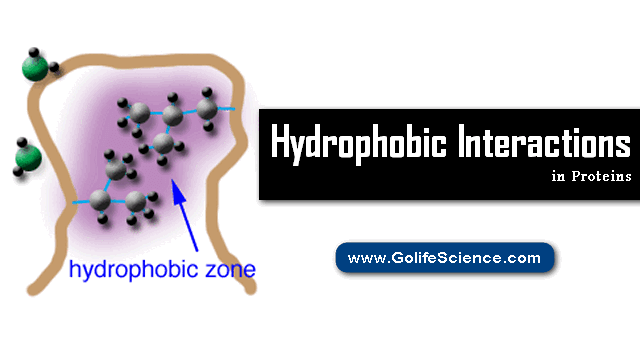 The image above indicates that when the hydrophobes come together, they will have less contact with water. They interact with a total of 16 water molecules before they come together and only 10 atoms after they interact. 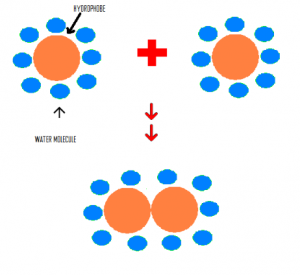 When an hydrophobe is dropped in an aqueous medium, hydrogen bonds between water molecules will be broken to make room for the hydrophobe; however, water molecules do not react with hydrophobe. This is considered an endothermic reaction because when bonds are broken heat is put into the system. What is Thermodynamics? Explain the Thermodynamic Laws? 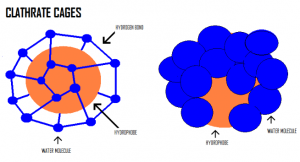 Water molecules that are distorted by the presence of the hydrophobe will make new hydrogen bonds and form an ice-like cage structure called a clathrate cage around the hydrophobe. This orientation makes the system (hydrophobe) more ordered. With a decrease in disorder, the entropy of the system decreases and, therefore ΔS is negative. The change enthalpy (ΔH) of the system can be negative, zero, or positive because the new hydrogen bonds can partially, completely, or overcompensate for the hydrogen bonds broken by the entrance of the hydrophobe. The change in enthalpy, however, is insignificant in determining the spontaneity of the reaction (mixing of hydrophobic molecules and water) because the change in entropy is very large. According to the Gibbs Free Energy formula, ΔG=ΔH−TΔS, with a small unknown value of ΔH and a large negative value of ΔS, the value of ΔG will turn out to be positive. A positive ΔG indicates that the mixing of the hydrophobe and water molecules is not spontaneous. The mixing hydrophobes and water molecules are not spontaneous; however, hydrophobic interactions between hydrophobes are spontaneous. When hydrophobes come together and interact with each other, enthalpy increases ( ΔH is positive) because some of the hydrogen bonds that form the clathrate cage will be broken. Tearing down a portion of the clathrate cage will cause the entropy to increase ( ΔS is positive), since forming it decreases the entropy. 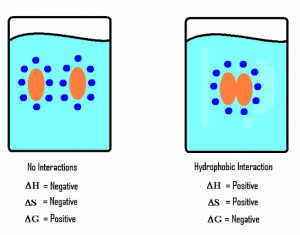 Result: ΔG is negative and hence hydrophobic interactions are spontaneous. hydrophobic interaction in protein is relatively stronger than other weak intermolecular forces (i.e. Van der Waals interactions or Hydrogen bonds). What does the strength of Hydrophobic Interactions depend on? Temperature: As temperature increases, the strength of hydrophobic interactions increases also. However, at an extreme temperature, hydrophobic interactions will denature. The number of carbons on the hydrophobes: Molecules with the greatest number of carbons will have the strongest hydrophobic interactions. The shape of the hydrophobes: Aliphatic organic molecules have stronger interactions than aromatic compounds. Branches on a carbon chain will reduce the hydrophobic effect of that molecule and linear carbon chain can produce the largest hydrophobic interaction. This is so because carbon branches produce steric hindrance, so it is harder for two hydrophobes to have very close interactions with each other to minimize their contact with water. Hydrophobic Interactions is important for the folding of proteins. This is important in keeping a protein alive and biologically active because it allows the protein to decrease in the surface is and reduces the undesirable interactions with water. Besides proteins, there are many other biological substances that rely on hydrophobic interactions for its survival and functions, like the phospholipid bilayer membranes in every cell of your body!